Sonoma State University Professors Karin Enstam Jaffe and Patrick Jackson are the recipients of the 2015-2016 President's Excellence in Scholarship award. The award honors faculty for their outstanding scholarship, commitment to student participation in research, and their creative approaches for making their scholarship available beyond the academic community. It recognizes the important connection between faculty professional development and enriched learning environments for students. Sonoma State Anthropology Professor Karin Jaffe serves as a research affiliate at the Oakland Zoo. She has created research opportunities at the San Francisco Zoo, the Oakland Zoo and Safari West Wild Animal Park in Santa Rosa providing hands-on training, graduate school preparation, and career opportunities for students. In addition to her own scholarship and publications, she has co-authored articles with undergraduate and graduate students and presented with students at key professional conferences in her field. Jaffe supports her students as they push through challenges, all while creating extraordinary research opportunities. Criminology & Criminal Justice Studies Professor Patrick Jackson is engaged with issues critical to local, national and international communities and regularly includes and mentors undergraduate students in this work. His scholarship record, service to the university and local community, and his work with undergraduate students in and out of the classroom exemplify the type of achievement that the President's Excellence in Scholarship was created to recognize. Jackson is also founding editor of the "Western Criminology Review," the official online journal of the Western Society of Criminology. The recipients receive $1,500 to support ongoing scholarship efforts. 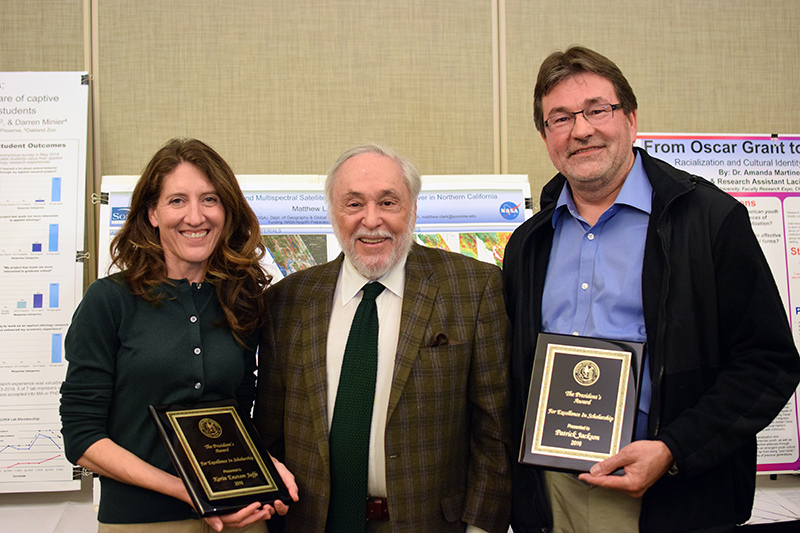 Both Jackson and Jaffe were recognized for this achievement at the Faculty Research Exposition on April 27, where President Ruben Armiñana spoke and presented them with the awards. SSU President Ruben Armiñana was honored with a Spirit of Sonoma award at the 11th annual luncheon last week sponsored by the Sonoma County Economic Development Board.